At least some of those reading this would be honest to say that they don’t love Muslims. Maybe not hate, more like ignorance or possibly fear is what is experienced. But when we have even one Muslim friend, everything changes. And for those of you who pray, regularly remembering Muslims in love, faith and hope can also change our hearts and minds. In just a few weeks the Muslim world will be fasting and praying for a month. An initiative that started over 20 years will happen again, to pray for Muslims during those 30 Days. You can order a prayer guide from the web site at the end of this post. I’ve asked my friend Tamara, the International Coordinator, to write a guest post about this important act of love. “Back in 1993 a group of Christians were in the Middle East and began asking God to change the way they understood the Muslim world. Inspired by a revelation of God’s love for the individuals, families, tribes and nations that make up the Muslim world they began to encourage others to pray for the Muslim world too, and to particularly focus on this during the month of Ramadan when Muslims themselves celebrate their holy month with prayer and fasting. Prayer is a fundamental activity for both Christians and Muslims. We pray in order to allow our own way of thinking or feeling to be intruded upon by the Divine. Through prayer, we invite God’s ways – His peace, His hope, His love – to become our ways, both in the world and in our own lives. 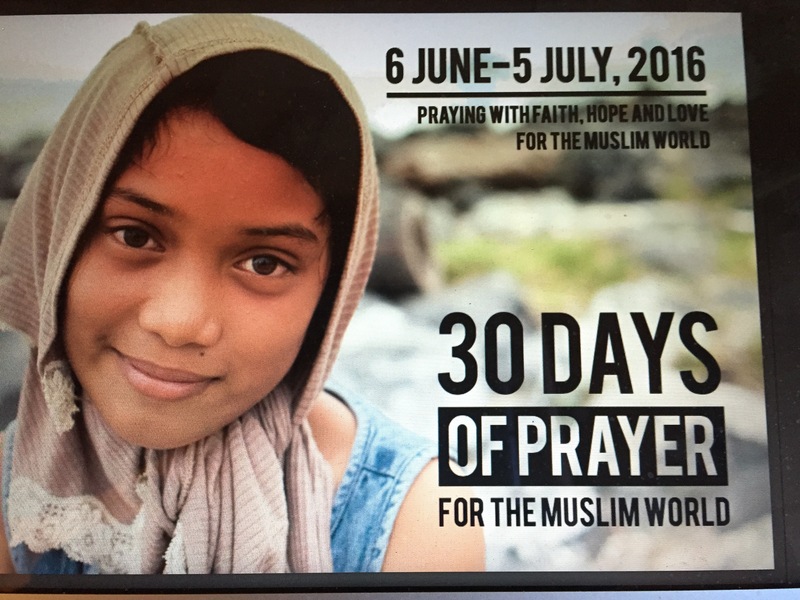 That original prayer focus has become an annual event known as, “30 Days of Prayer for the Muslim World,” and an estimated 500 000 Christians participate each year in over 20 languages. Participants follow a prayer guide that directs Christians to pray for Muslims as an act of love, sharing their burdens, understanding their concerns and petitioning God to help them. In this way, we fulfill the command of Jesus to love our neighbors. In most parts of the world, news about Muslim people hits the headlines on a regular basis. With more information at our disposal than ever before, it is necessary to use discernment in how we form our understanding about the world around us. The 30 Days prayer guide draws its information about the Muslim world from people who live among Muslims with the aim of loving and blessing them and tries to echo their voices. 30 Days believes that we can best understand what Muslims believe from Muslims themselves and tries to help readers recognize the diversity that exists in culture and theology within the Muslim world. This kind of informed prayer helps balance the view of Muslims formed by headline news. In the 2016 edition, the guide explores the journeys – both physical and spiritual – taken by Muslim people around the world. Readers will learn about refugees, nomadic tribes, pilgrims, migrants and other Muslims whose journeys will help them to pray and to think more deeply about how they view the Muslim world. Thanks Tamara! Please do order a prayer guide from the site below, and pray for Muslims around you and in other lands. Be an instrument of love, not of hate, ignorance or fear.